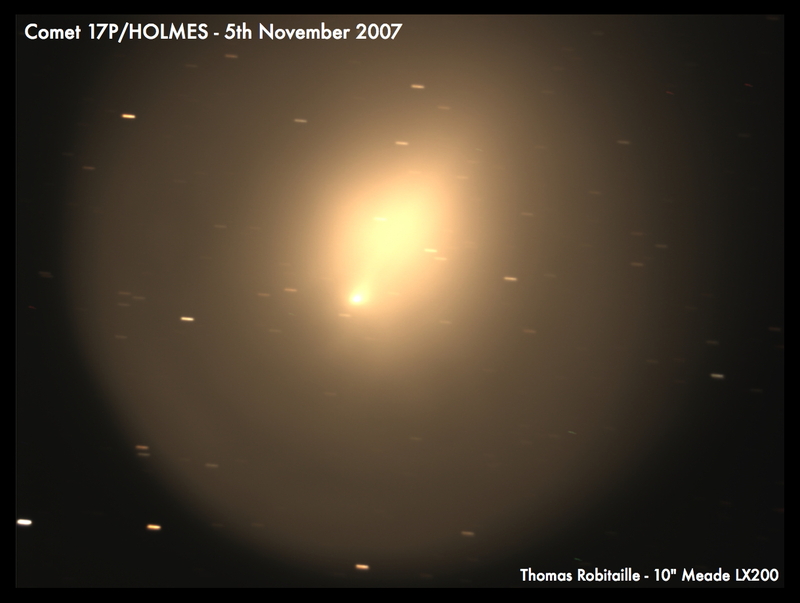 In comparative exposures using the same Borg77 scope, ATK16HR camera, and five minute sub-exposures binned 2x2 for greater sensitivity, Holmes exhibited a faint tail on November 1. The tail was no longer evident last night November 7. 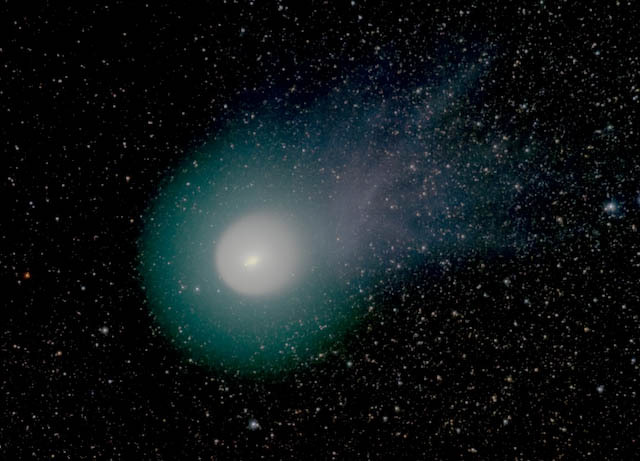 The brighter inner core appears to have expanded from Nov 1 to 7, but the overall comet size has shrunk without the presence of the outer emerald halo. 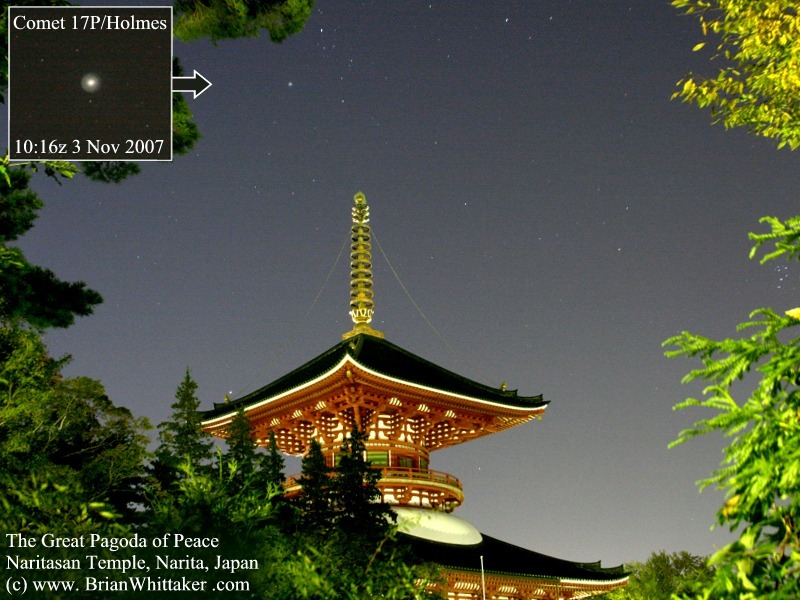 Comet 17P/Holmes was easily visible with the Naritasan Temples depite the bright sky close to Tokyo. 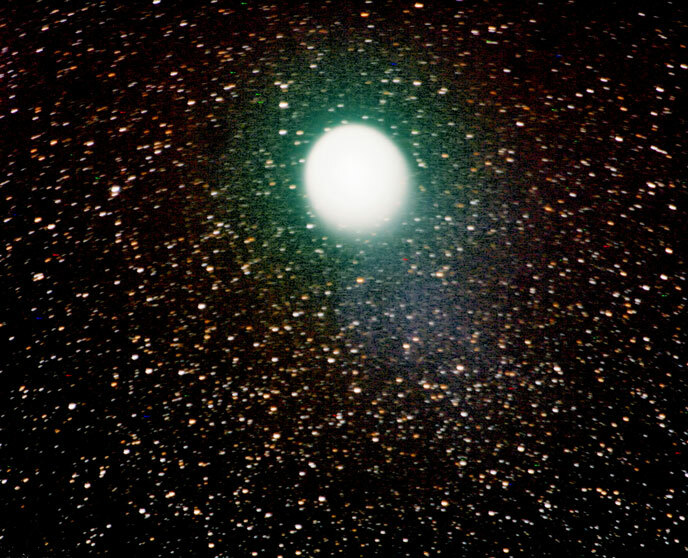 Tonight I ventured out into the dark countryside and it was quite cold but very transparent - AND good seeing! 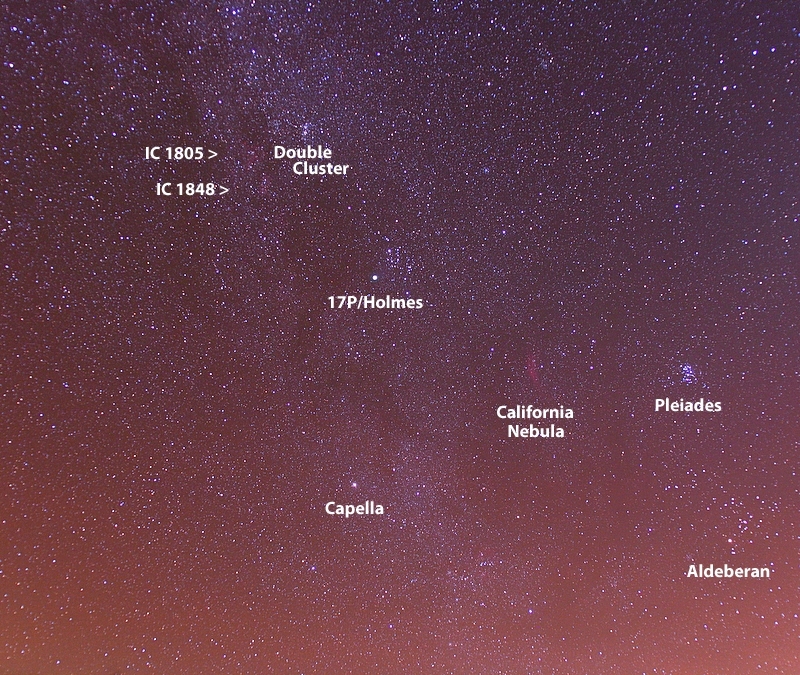 I decided to capture 17P/Holmes with various focal lengths to get different deep-sky objects. All are labeled. Canon Rebel XTi with, respectively, Nikkor 135, 85, 50, and 16mm lenses, all @ f/4. 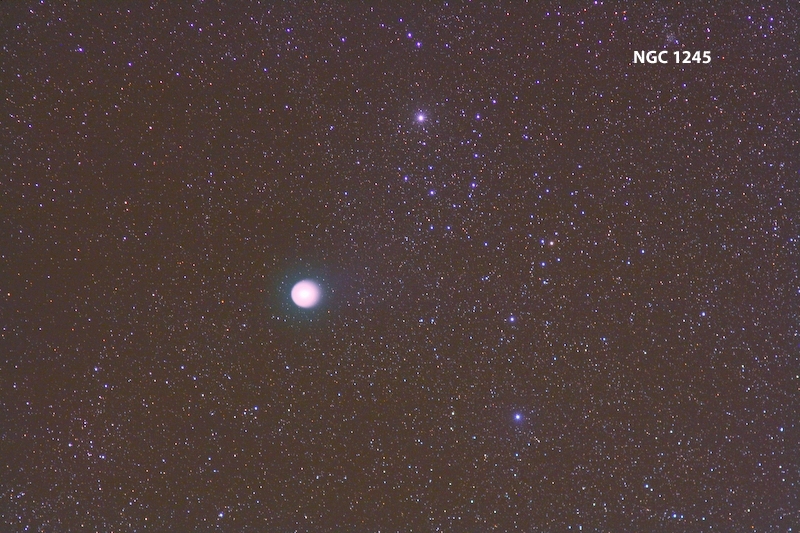 Exposures were all 4 minutes at ISO 400. Mutability of ion tail. 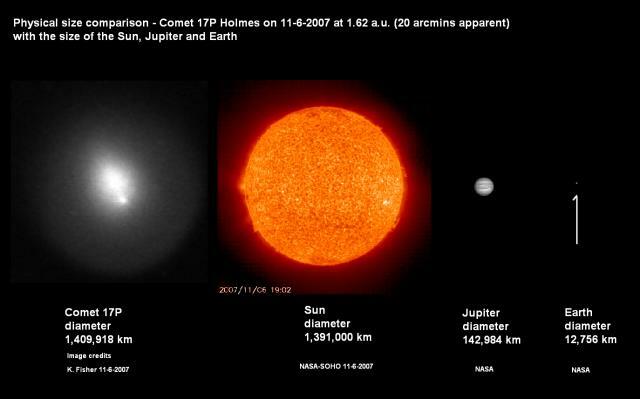 Major changes of shape take place every day. 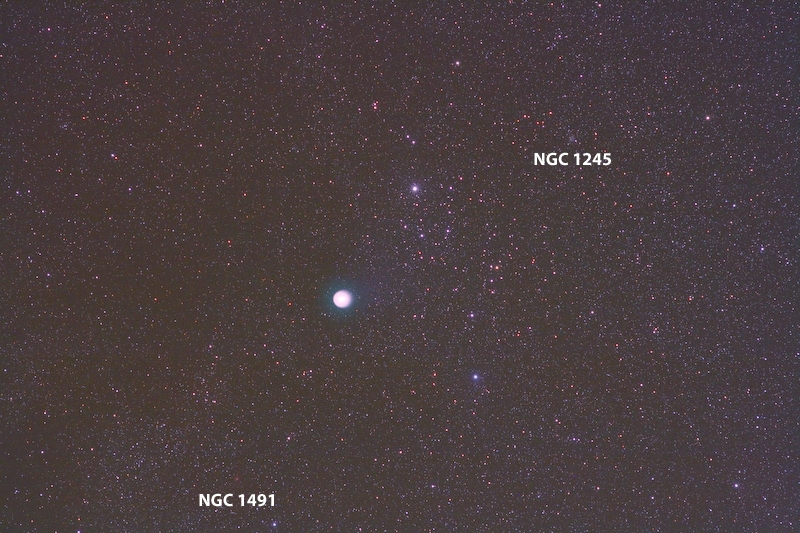 On the left, comet appearance on November 3, right-hand side show the same on November 5. I use negative images to enhance delicate details. 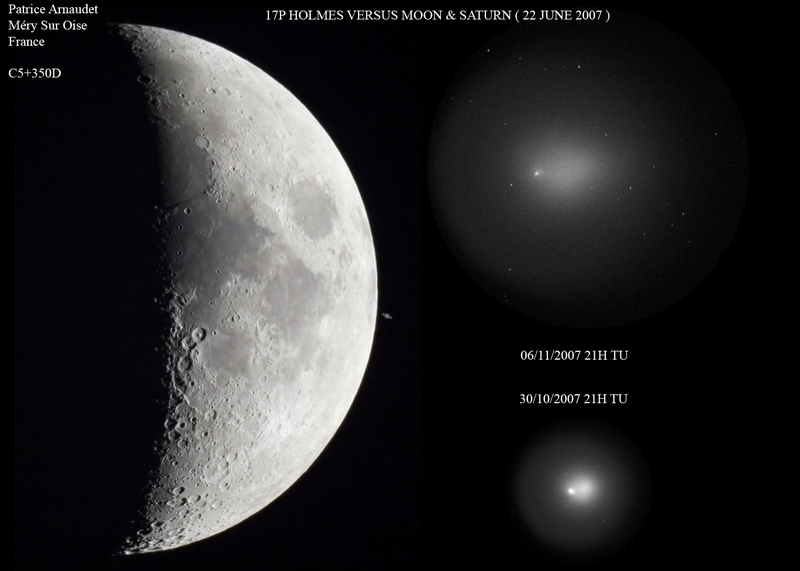 I took these photos through a Miniborg 45 refractor with a Starlight Xpress SXV-H9 monocromatic CCD and a blu filter, from a suburban area near centre of Italy. 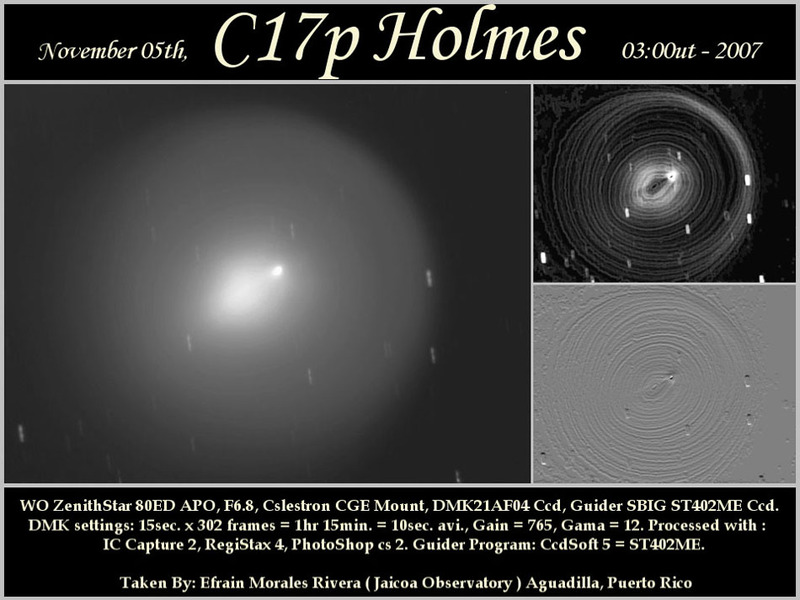 Stacked & Composited from almost 4 hours of data to show details from core to tail streamers. 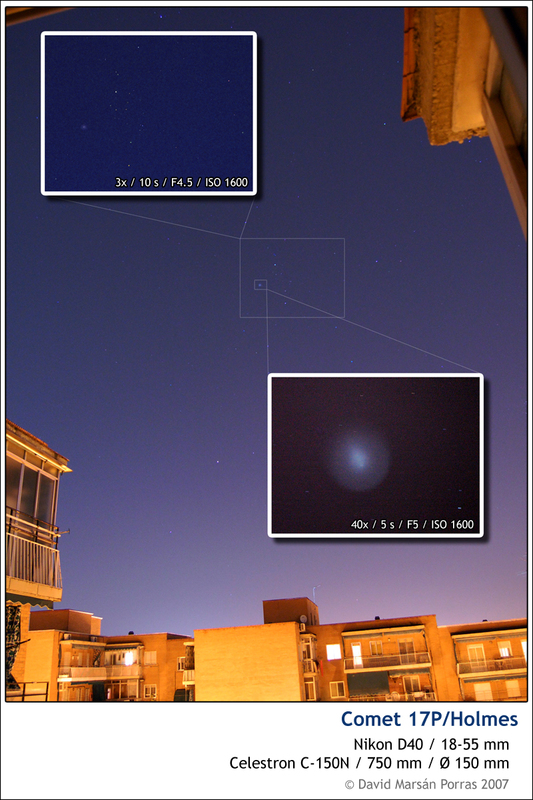 Clouds limited imaging time. 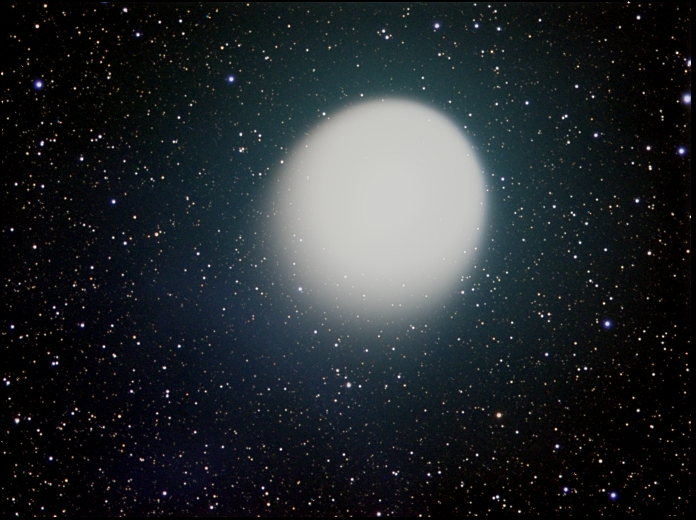 Canon 20D 100-400L @400mm f5.6 ISO1600 initial processing in Iris. 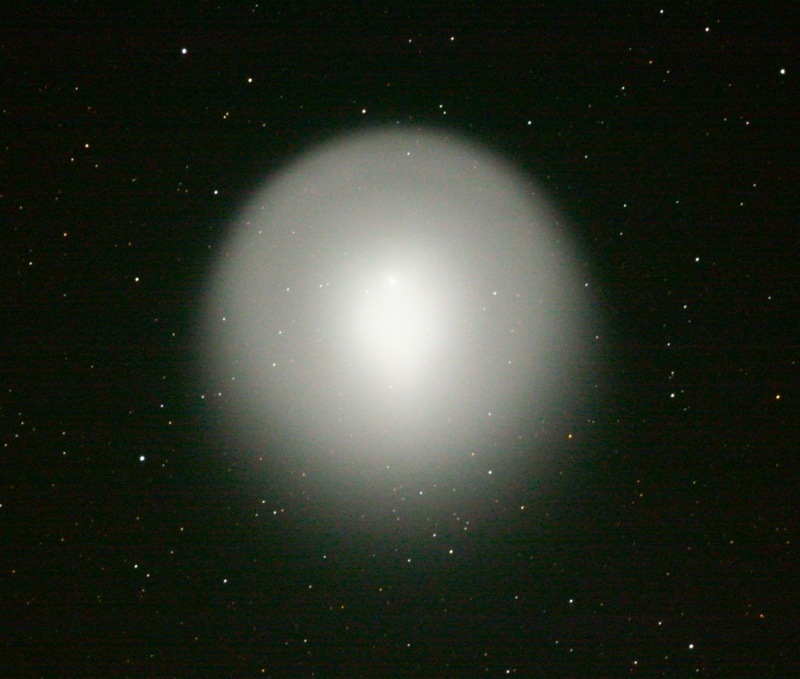 Comet Holmes photographed through a 6-inch telescope at F/8 with a Canon 20D DSLR camera. 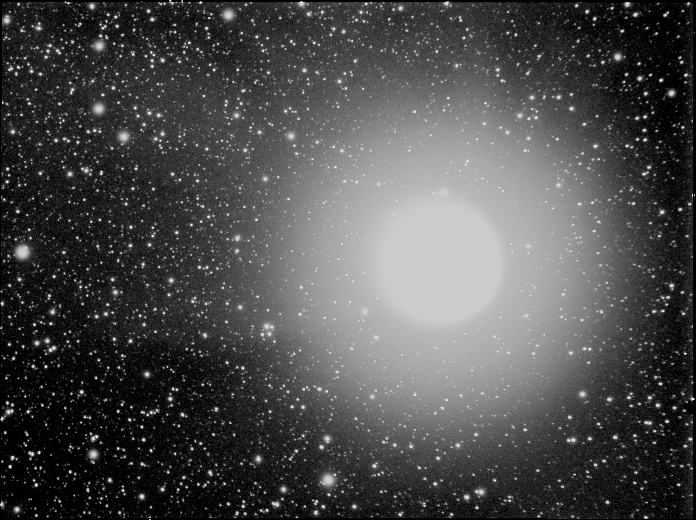 ISO 400 for 8 minutes. 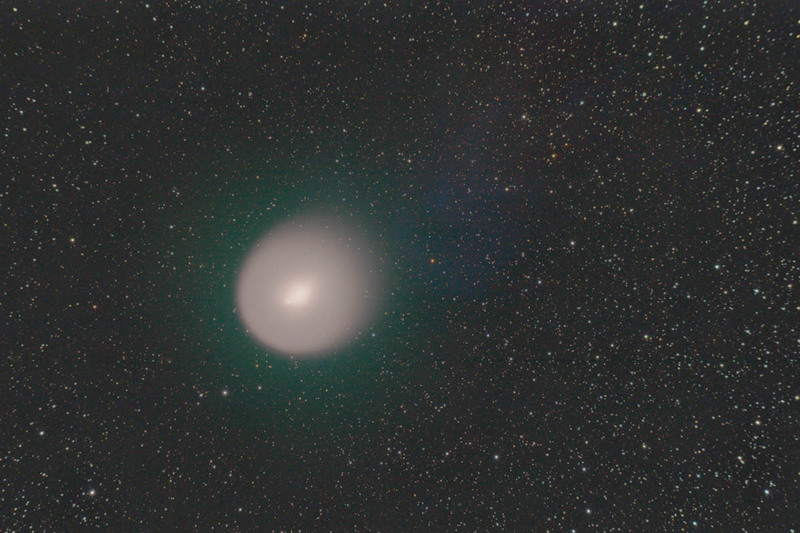 COMET HOLMES: 115 Years and Counting Last night, November 6, marked a milestone for Comet 17P/Holmes. 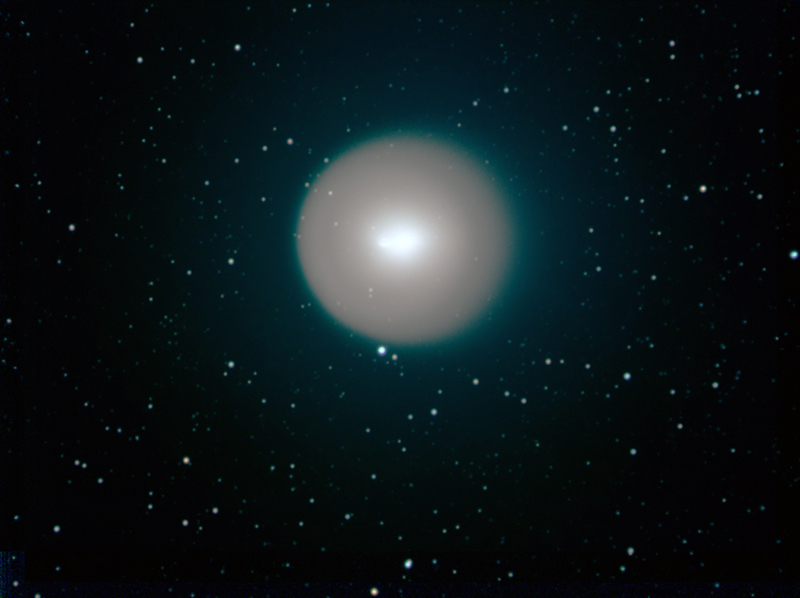 According to Gary Kronk’s Cometography website, it was exactly 115 years ago –- on the evening of November 6, 1892 –- that English amateur astronomer Edwin Holmes first sighted the comet while observing M31, the Andromeda Galaxy, with his 32-cm reflector. 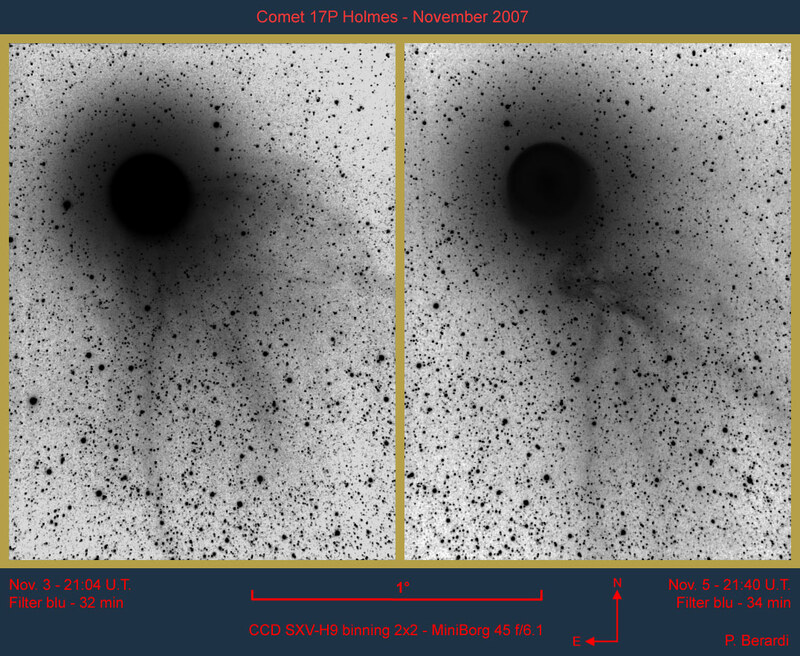 It’s amazing to think that the light we see now came from the same object that was also in outburst more than a century ago. 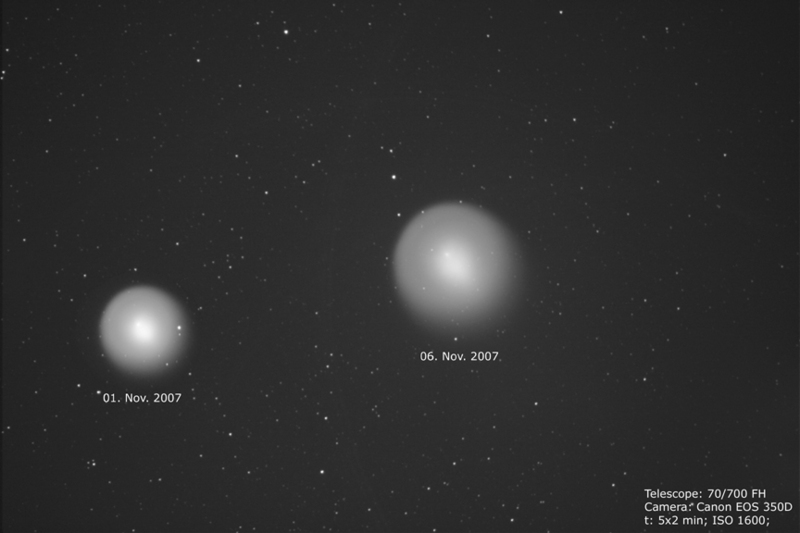 This sequence of images, taken on October 28, November 2, and November 6, shows the dramatic expansion of Comet Holmes’s coma in just nine days. 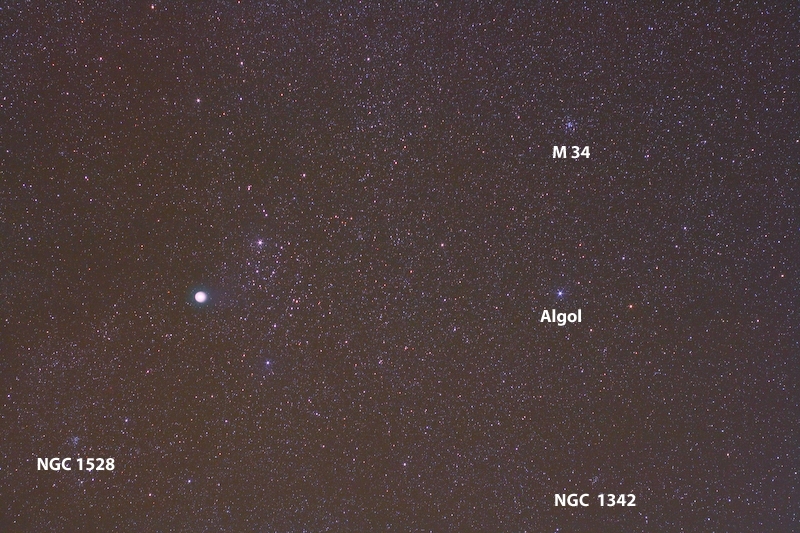 The images were recorded at the same scale and using the same setup (8-inch f/10 Meade Schmidt-Cassegrain telescope and Canon EOS 20D digital SLR camera). 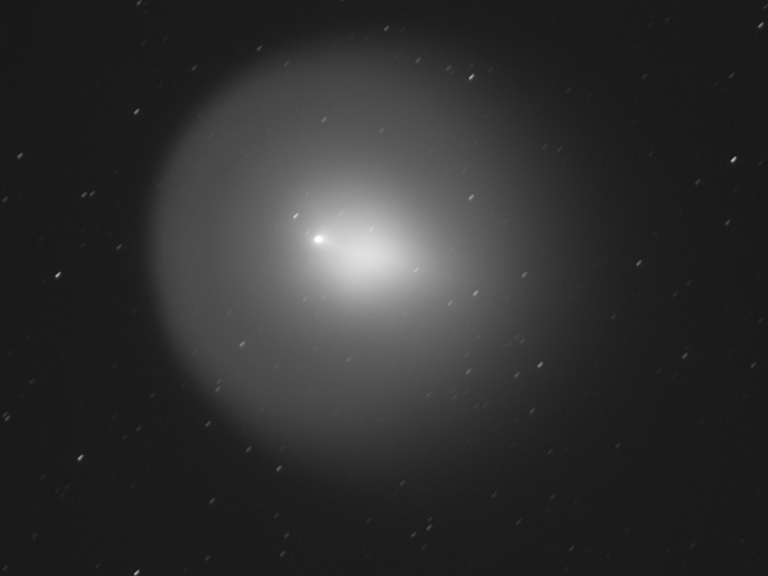 The comet’s coma now nearly fills the camera’s field of view, but its surface brightness has also decreased significantly. 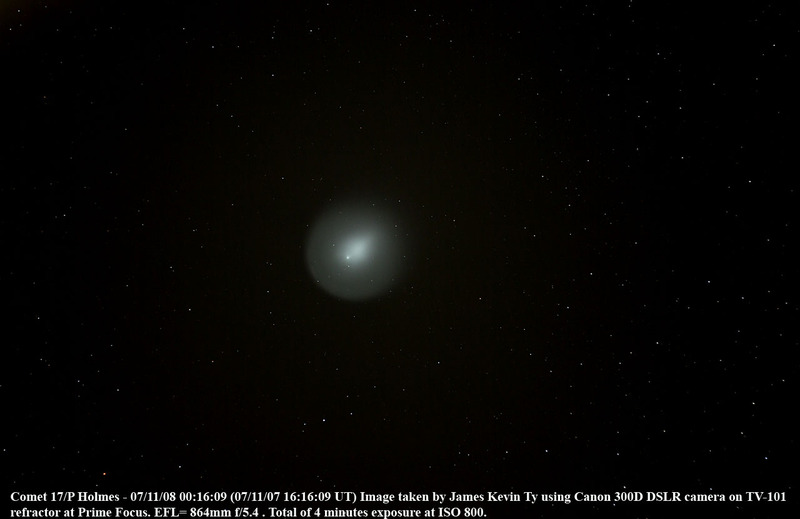 In fact, we had to boost the camera’s ISO setting from 400 to 1600 in order to record the same level of brightness during the 30-second exposure as we did in late October.